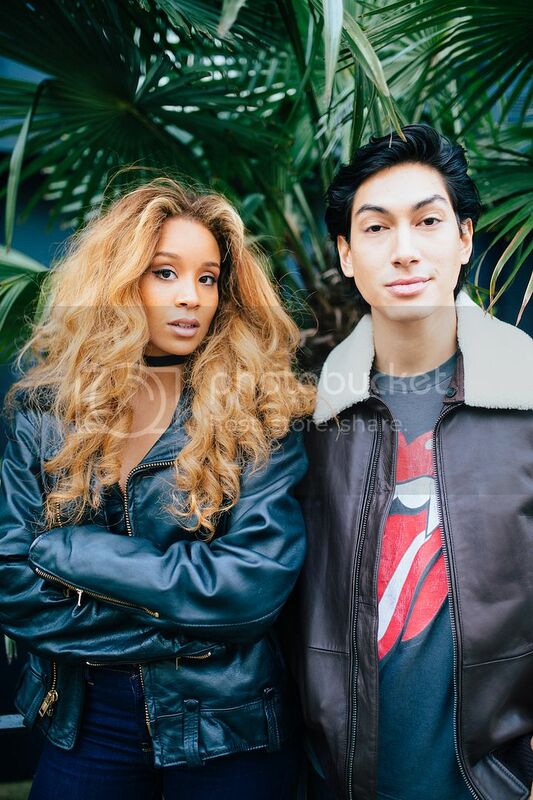 The 405 meets Lion Babe: "I feel like this is my first baby." 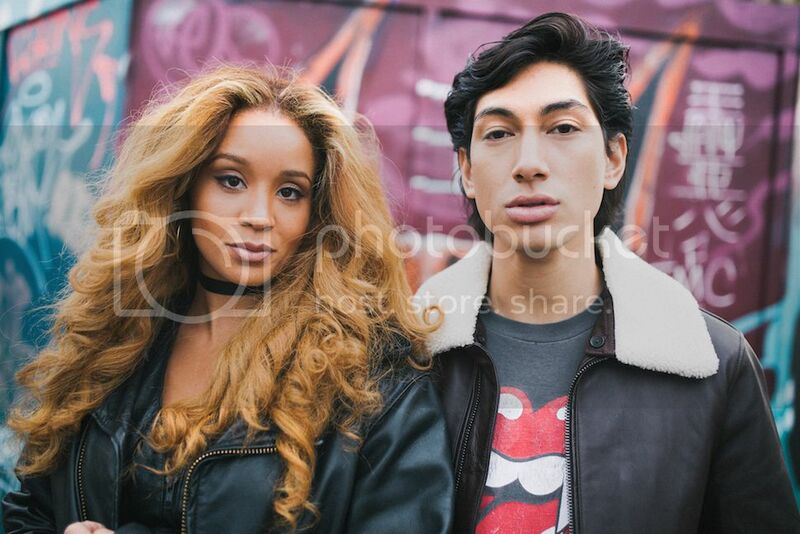 Courtney Buck catches with Lion Babe (Jillian Hervey and Lucas Goodman) to discuss their debut album, collaborations and future plans. All photos by Phil Smithies. After being introduced to Lion Babe by a friend, who discovered their DIY video for 'Treat Me Like Fire' some three years ago, I immediately knew there was something unique about this duo. From the outside looking in, it seemed as though the pair had spent a lot of time honing their craft to perfection with intricacy. But unbeknown to most, at the time, Jillian Hervey and Lucas Goodman had only recorded just one song to date, but this one song is what started the chain of events that soon followed and brought them to Begin - their debut album, which is now out and available to all. It's less than 24 hours to go until the release of Begin when I meet up with Jillian and Lucas at the trendy Electric House in West London. A few hours earlier, they landed at Heathrow and since then, it's been a day of promotional activities. They're here for about five days this time but it's perhaps the most important trip to date. Although jet lagged, the pair are still witty and happy to push on with the day. As I set up, Jillian is writing a letter to their fans for their mailer, which may be a little ill-timed ("I love writing them but it's just the timing right now [laughs]"). They're excited if not a little relieved for the album's release as it's been a long time coming. This isn't out first meeting. In fact, this isn't even our first time talking. We originally had a somewhat haphazardly arranged conversation on the phone in the winter of 2014. The pair were back in New York having recently completed one of their first of many trips to the UK. It's been two years since our first interview and a lot has changed since. When we first spoke, Jillian and Lucas had not long inked a record deal with Amanda Ghost's Outsiders imprint at Polydor Records and were preparing to release their debut EP, led by the ferocious Childish Gambino-featured 'Jump Hi'. Since then, they've notched up three further critically acclaimed singles and secured an impressive 15 million streams across streaming sites. Jillian's face has been plastered across every fashion magazine you can think of and they've appeared at pretty much every festival going. Trust me; Lion Babe is in. You're about to release your album, how are you feeling? Lucas: Let's just get it out there, already! Roughly, how long have you been working on the album? J: Really, since we started Lion Babe. 'Treat Me Like Fire' was the first song we ever did and from that point on, it was kind of building to what we knew would be our first album, somewhere in the distant future but we knew had to write, figure out our sound and almost do more to know what we wanted to start with. When we first spoke, I recall you saying that when you recorded 'Treat Me Like Fire', that was the only song you had recorded. But now, I'd imagine you've worked with lots of different writers and producers trying to find that Lion Babe sound...? Yeah, I think the greatest thing about 'Treat Me Like Fire' is we just had it and it's always been our point of reference knowing that, whether we were trying to or not, we kind of found a sound within the first step but then it was about "how do we grow this? How do we continue it and try other things?" Collaborating has been a really nice way to test out all these different things and also you just work with people and it becomes obvious of what you like, what you don't like, what feels good, just hearing what it's like to work with other people. The two of us working together; that's something but then you throw another person into the mix and then It changes a little bit. It's kind of inevitable as you collaborate, everything is going to sound a little different because it's different people. Working with so many different collaborators, have any attempted to perhaps change your sound? L: I think most people that wanted to work with did because they liked ['Treat Me Like Fire'] so it was more like "Oh, that's cool, I dig what you're doing, let's make something." J: I think 'Where Do We Go' is the one track that felt different just because it was a finished song already. It was something that was presented to us like "Oh, Lion Babe, you guys can carry the torch on this!" That was the one thing we knew at that point; we heard it and knew there was all this potential around it but we knew there was going to have to be a way for us to really put our fingers in it and make it our own. L: When we first heard the song it was this very traditional sounding disco record, like, to a T. All funk & bass guitar, and that was cool but we were like "we like these strings..." So we had to remake the track and Jill liked the whole "where do we go?" message of it but all the lyrics in the verse weren't anything that she would say so we changed all of those. That was definitely the first time the label came to us and said, "We think this might be good for you guys, we think you should try it." So we said "Ok, but if we're going to do it, we definitely need to dissect it and rebuild it up from scratch to make it ours" but any parts we wanted to keep, we did. J: But that's part of the partnership. I think they understand things that we don't understand about certain things and the thing we knew about that song specifically was, it can bring in other people that maybe wouldn't know or come across something like 'Treat Me Like Fire' but then they hear that and that's enough of a universal vibe that can pull them in and really get into our world and I think there's tons of artists that have done that; it's ok to do that. Do you have a favourite track on the album? L: Like, the original voice memo for that song is definitely pre-releasing 'Treat Me Like Fire' so around 2012; the original concept of 'Got Body'. J: I think just having a sample back in the mix, it feels like where we started but also, once we did get around to record it, it did sound so much bigger than we would have ever made it when we first started. I love the message and it just feels good. It's funky! L: The two I'm feeling a lot is 'Stressed Out!' and 'Satisfy My Love'. They're my two favourites; also based on different times, like, 'Satisfy My Love' feels like a late night kind of record. You've performed a couple of headline shows and did much of the festival circuit last year and I think a lot of people really took to you quite quickly here; perhaps more so than back in the US. Was that an intentional move? J: Yeah, all these people; they had such a huge following out here and then they did go back to the States afterwards but I think when we first made the commitment to do it, we didn't realise how much we would be here. Obviously, you're working here and you have all these shows so you're just here! It kind of just fell into place. We just try to ride the wave; if you get more shows, like, you don't just do one festival, you do all these other festivals too. I didn't even realise how many UK festivals there were to do! But then again, it's so concentrated and we have a lot of resources here that are amazing for us, that I think helped us build faster. Even our live sound; we have a great team, the backing vocalists I use are the same one's I always use, our band is here so to test that out has been really nice verses New York which is a bit more scattered. I think it's the idea that it's much bigger in the US so where do you focus first? It's been nice to build it here because London is like this hub of activity, you can test it all out at once. J: Oh, I loved it! I love performing so... it's so crazy when you get ready, especially for their show because I'm like, the third to last song so I'm there from around 5pm, just chilling then all this energy just comes out from my song for like the three minutes and it goes by in 10 seconds, I'm like "That was fun! Ok, it's over." Just to play in front of all of those crowds and to have an opportunity to represent us and also get a taste of... I don't see why we would not be able to play arenas like that and it's an exciting thing to work towards. Their production is really big but they have such a great team behind them also and you can tell that they put in the hours. It's just inspiring and it was one of the highlights of last year; travelling, being on tour and obviously it's more their thing than my thing; to be in somebody else's world for a little bit has been a nice release. You do your thing as Lion Babe and then you have to come back out again to perform 'Hourglass' so it must take a lot out of you? I know! It can be tiring but it's also fun. You just have this weird adrenaline rush and it can be a two-week adrenaline rush but as soon as you're out of it, you realise "Oh my God, I'm so tired!" but you just go with it. How did the Disclosure collaboration come together? L: They reached out when we put 'Treat Me Like Fire' out, they've always said that they were into it. One of the first times it was ever played here I think was when they played it on Annie Mac's show on BBC Radio 1 and that was an awesome thing for them to do; they were totally bigging us up and it was amazing. When we met them, they're like homies. They're super cool and we had a lot of fun hanging out with them. J: I toured Australia with them; Lucas was my tour manager and it was just so fun to travel to a place like that. I kept thinking "How am I playing the Sydney Opera House?" I just think of Finding Nemo! [Laughs] We played Madison Square Garden, we supported them on that show and that was such a huge moment for us because even that venue might not even be there for too long so to just have that experience and to have a group that's making their own waves; I just think they're doing so well. It's very exciting to have that connection, besides our friend Joel Compass, we don't have as many "artist artists" that are really in the game doing their stuff that we talk to on a really friendly basis so it's really nice to have them like my family. It's like having another family with them. Jillian - you'd said in another interview that you hadn't told your parents about Lion Babe until you'd released 'Treat Me Like Fire'. What did they think you were doing at the time? [Laughs] I was freelance dancing at the time, so I did a few pieces. I had collaborated with artists, choreographed some stuff, I was dancing with one of my mentors from college at his company so I was working around plus I was hosting at this pizza place. Also, I had just graduated so I was having a lot of fun, partying, being downtown, hanging out with my friends... 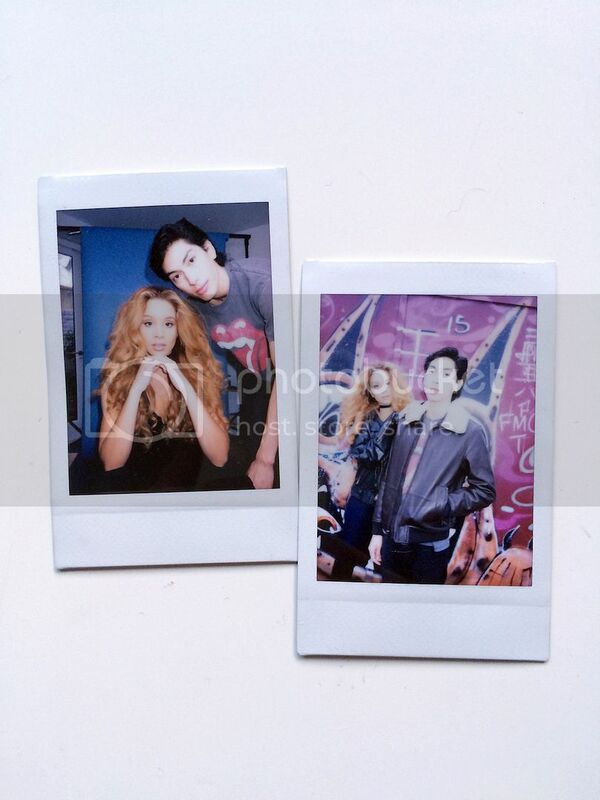 I didn't want to tell anyone [about LION BABE] until it was done. I didn't know when it was going to ever be finished so I didn't want to say I was doing all this for it to never come to anything. My family have always been very supportive but everyone's always just doing their own thing then when they're ready to share it, they just do, that's kind of how we roll. Your mother joined you at your last London show at Heaven so it must have been nice to be on the road with family? We were in Glasgow on Thanksgiving and my mom and my sister were there with us and that was so nice. That was the one thing I was worried about; not being with any family for Thanksgiving; Lucas and I knew we'd have each other but at least we had some representation of family here and it was so nice because my sister had been talking about coming over here for a while, she's obsessed with London so it was the best. It's always nice when family come to shows because it makes them very special shows. Lucas - you're a producer and you were making music before Lion Babe. Do you have plans to work with anyone outside of the band? L: [Laughs] And you get to make something new and different. I would love to work with some rappers because when I first got into production, that kind of music was what got me into making music. I grew up playing the guitar, I had a punk band vibe in high school but I was listening to all this Wu-Tang and [J]Dilla stuff... I would love to do some stuff on that level but I think the biggest thing when working with other people is you want to work with a performer or artist who is genuinely doing something really dope which is sometimes hard to find. I was working with other friends and stuff before the band but it's one thing to be creative and have cool ideas but it's another thing to be like "Ok, I'm actually going to drive this thing and make it happen." When we first started working together, we definitely had a similar mind-set in that we thought "Oh, well if we're going to make something, let's do something with it and not just let it sit in iTunes forever and never be heard." Right now I'm working on some remixes and some beats that I'll drop soon; just some fun stuff for myself but really, I'm most interested in getting back into the Lion Babe stuff and making some new Lion Babe music. Have you started working on the next album already? J: We're definitely already thinking about the second album and thinking about new music that we want to put out. I think it was already happening as we were wrapping up this one and with most things you have these plans but we kept coming back to "Ok, we've got to finish this album first so let's not get too excited about the new stuff." You've spent a lot of time in London now, do you have any favourite spots yet? L: This is a place we're quite familiar with! J: West Thirty Six we've been really liking, they do some great food. Obviously, Westfield, we've seen a few movies there, there's a little Chinese spot we always go to when we land, I don't even know the name but they always know us and they always try to ask us for ID, like, you've seen us before and nobody else comes in looking like us [laughs]. But we're foodies so it's probably all food places! I didn't know they were knocking down Sarm? L: They have a new one though. J: [Laughs] But this is our life! L: Yeah but we'd love to just come out here and chill out for a while. J: One day we'll go on a double decker bus and go around London. When you're back home in New York, what do you like to do in your downtime? J: Honestly, like, for instance, there was a blizzard in New York recently and that hasn't happened in a minute so I was so excited to be able to just be trapped inside; I was cooking anything and everything I saw. I love cooking and I hadn't been able to in a while. I have a dog so I love spending time with her, catching up on Netflix and really, I love being inside, being in pyjamas, not having to do anything, having a relaxing time is my favourite. L: Just seeing your people; friends and family. You don't get to do that as much; it's like "Oh, I haven't seen this person in two months" and I live like one train stop away from them. J: And I've been seeing some theatre finally. We haven't been home in a while so I went to see a bunch of different stuff with one of my best friends; she's a die-hard theatre fan so I'm always going to see shows with her. What's your favourite show on Netflix? J: I got into Orange Is The New Black when we were over here but then there's so many episodes that I lost track but then they're killing it and winning everything so now I really want to know what's Up! I have to get to a moment when I know I can really binge watch but I'll get there. L: There's some dope Kung Fu stuff on there too. L: It's interesting that there was such a time when that was a "thing" and you don't really see any of that anymore. I would be so down to go to a vintage store and pick up a Rocawear shirt from 2002! Finally, for someone who hasn't heard your music before, why would you recommend they pick up your album? J: I just think we're doing something a little differently and it's a refreshing sound. There's a lot in there for a lot of different people so if you're curious, check it out! Begin is available now. Lion Babe will headline London's KOKO on June 1, with tickets also available now.